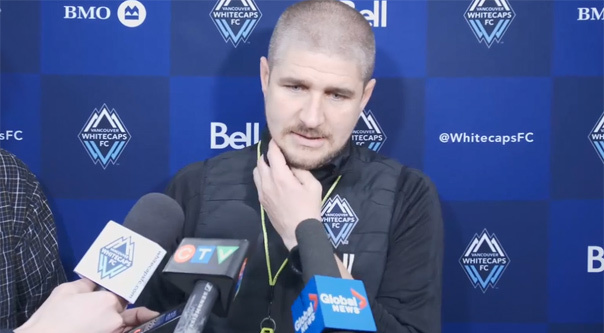 VANCOUVER, B.C - Spring hasn't quite hit Vancouver yet, but the temperature has been turned up on Vancouver Whitecaps FC. Fans aren't best pleased with a 3-3-1 start to the season and a 1-1-1 record at B.C. Place. Vancouver has not scored at home in 200 minutes of play. Supporters voiced their displeasure by boo'ing the team off the pitch on Friday night after a lacklustre 2-0 loss to expansion side, Los Angeles FC. The paying customer always has the right to make their voices heard. They're paying hard-earned dollars to watch a side that's void of entertaining football at home. The road warrior Whitecaps FC haven't yet found form at home, like they have on the road. Luckily, the Caps are back on the road as they travel to the mid-west to take on MLS western conference leading Sporting Kansas City at Children's Mercy Park on Friday night. Coach Peter Vermes and his team are 4-1-2 on the season. As you can imagine the front office, players, and coaches are quite aware of the reaction coming from Whitecaps FC supporters. The fans watched Vancouver fall to rival Seattle Sounders FC in last year’s MLS quarter-finals without mustering any offence. The theory that Vancouver is heading down a similar path this season is a cautious cause for concern. A suggested discussion brought up by fans on a recent Vancouver podcast pondered Coach Carl Robinson's job security. After Friday's loss, Red Nation Online asked Robinson what he thought this type of performance and loss does to that noise. "I don’t listen to podcasts, so I'll make you aware of that." Robinson said. "I’m the manager of this football club. I’ll continue to come to work every day and work as hard as I can, and try to get the best out of my players. Today wasn’t our day, it was a disappointing result, and I’ll take responsibility for that." As you would expect, the gaffer is out in front and taking the brunt of fan criticism to protect his players. Footballers play, and coaches coach. Robinson's starting eleven didn't get the job done and fans are upset. It wasn't just a minority group of fans in a small section on Friday. Asked about being boo'd off the pitch, Robinson shared his thoughts. "I was as disappointed as every one of those supporters in the stadium." Robinson explained following training on Monday. "Players don't go out there to not play well. They work and they run and they try. Sometimes it doesn't happen. We were disappointed. I can understand their disappointment. We will get back to work. You have to remember what we've done and where we've come, how far we've come. Sometimes people have short memories. I don't. We don't. I try to encourage the players and that's why I took responsibility for them. I think if you ask them they will tell you they didn't play to their levels. That's why I said maybe it was me. Maybe after the adjustment of Kei (Kamara) going down on Thursday I should have rethought it and played a different lineup based upon Kei (Kamara)." The 33 year-old Kamara, also addressed the booing that came at the final whistle. "Credit to them," Kamara said on Monday. "If we're not performing well, they've got to tell us we didn't do it. They expect more from us, I expect more from us being out there. We we're on the road for a couple of games, and coming back home, there has to be that energy, that itch from us that we're back home. We let each other down on Friday. That's something we all know, and that's something we're working so obviously it doesn't happen again." The Whitecaps FC joint leading scorer will be out of action for the next few weeks. Kamara is expected to miss the next three matches with a groin injury. The injury occurred on Thursday in the last few minutes of training. Kamara went down un-touched. Vancouver will look to fellow strikers Erik Hurtado and Anthony Blondell to lead the attack up top. "It's a big loss." Robinson revealed. "Any team that loses a key player and he's a key player for us, is going to be affected. We were affected on Friday. We didn't play well enough to win the game. We have to accept it. We weren't good enough on that day. But it was one day. Losing Kei is a big blow but we have to find solutions now to deal with that." Whitecaps FC have picked up one win in the previous five matches. If they are going to overcome Kamara's injury, and a tough stretch at home, they are going to have to find scoring contributions from throughout the lineup. That means everyone is going to have to step up with a goal-scoring committee that can hold the fort in Kamara's absence. "I think that's fair." Robinson agreed. "Having Yordy back, (Jordon) Munch is a week or two away. Having the wide players stepping up. Brek Shea has three goals in the early part of the season. Brek, Bernie (Ibini), (Cristian) Techera, (Alphonso Davies) Fonzy, Anthony (Blondell) and Erik (Hurtado), they've all got to step up now. But we've always been like that." If the powers that be listened to every complaint and bother that sports fans in Vancouver had there would be no sports teams left. If an organization dictates the day-to-day through the eyes of your fan base, you might as well be in the gallery getting peanuts. MLS is a long, gruelling grind of a season, and it's quite clear that the quick solution that Whitecaps FC fans want, isn't coming. Carl Robinson isn't going anywhere. There might be more fan driven noise than usual, but the organization is in no hurry to send Robinson packing. As we also know, the artificial turf isn't always greener on the other side.